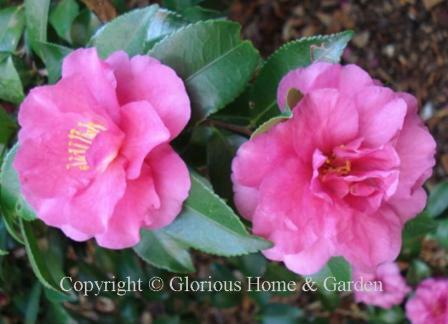 Camellia sasanqua is the queen of fall blooming shrubs. 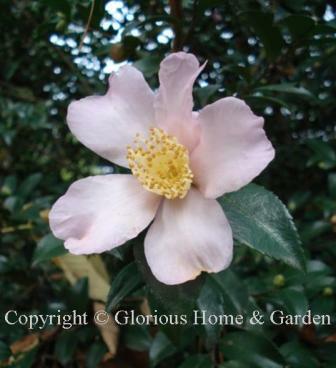 The Camellia sasanqua, one of the favorite plants of the South and milder areas of the country, is prized for its fall bloom, graceful habit, and lovely shades of white, pink, rose and red. These evergreens have glossy dark green leaves smaller than those of Camellia japonica giving them a more refined appearance. The flowers also may be slightly smaller than C. japonica (which bloom in the spring), but they make up for it in great profusion over a long period. They have many uses including screens, hedges, foundation plantings, specimens, espaliers and containers. 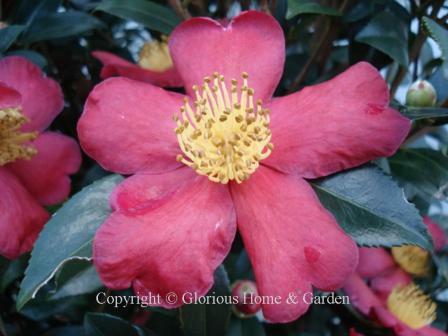 Camellia sasanquas should be part of every fall garden where they can be grown. Zones 7-9. New cultivars have been developed thanks to the breeding program of Dr. William Ackerman of the U.S. National Arboretum to increase cold hardiness. If you live in Zone 6, look for the "Winter's" series of cold-hardy hybrids at your local nursery such as 'Winter's Beauty,' pink; 'Winter's Interlude,' lavender-pink; or 'Winter's Waterlily,' white, and others. 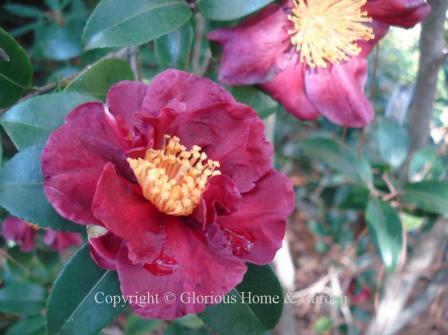 'Bonanza' is one of the deepest red Camellia sasanquas with semi-double peony shape blooms in a more compact 4-5' size. 'Hana Jiman' is one of my favorites. The name means 'boastful flower' and one can see why--not only are the semi-double blooms large, but they are dramatic with a starburst of yellow stamens--and they are fragrant to boot! They open wide and flat with a slightly crepey texture. The inner petals are white tinged with pink while the outer ones are a deeper pink at the edges. 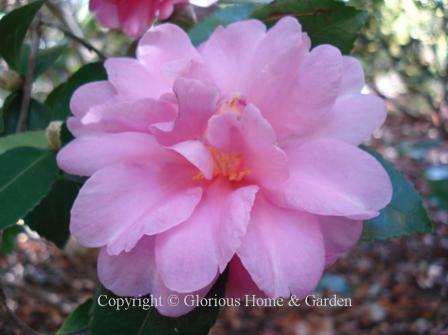 'Jean May' is a lovely double soft shell pink with ruffled petals. It will become 10' x 6' at maturity. 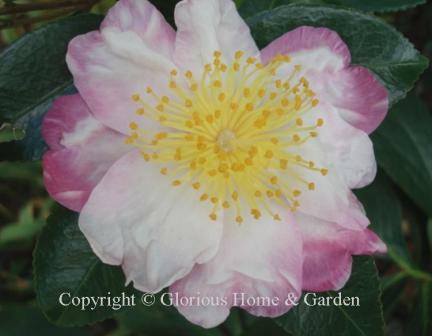 'Maiden's Blush' blush pink single form. There is a fabulous double hedge of these backing the spectacular long perennial border at the Sarah P. Duke Gardens in Durham, N.C.
'Midnight Lover' is a deep seductive red with a hint of blue in it--deeper than 'Yuletide.' Semi-double velvety ruffled petals with a center of golden stamens adds to the allure. This one at Smith-Gilbert Gardens in Kennesaw, Georgia. 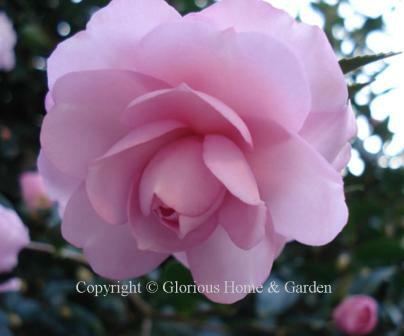 'Pink Snow' has charming blooms that look like pink sugar icing roses and open full and fluffy. 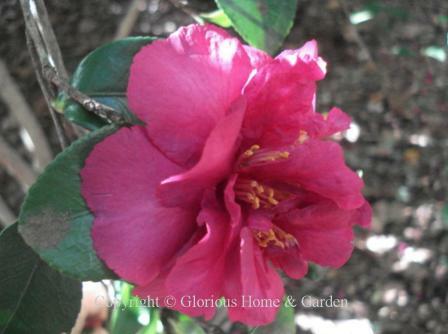 A very vigorous grower and prolific bloomer that can reach 15' if not kept in check. 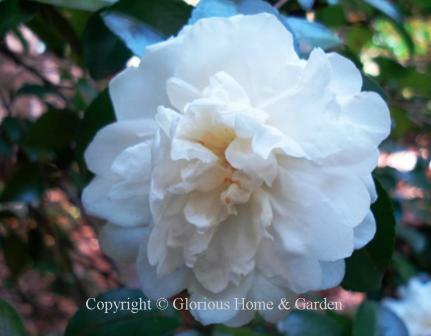 ‘Setsugekka' has large, semi-double ruffled white flowers with sometimes a touch of pink on the edges and golden stamens. Can reach a size of 8- 10' tall and wide at maturity. ‘Shibori-egao,' "Smiling Face," is a semi-double white with pink variegation. 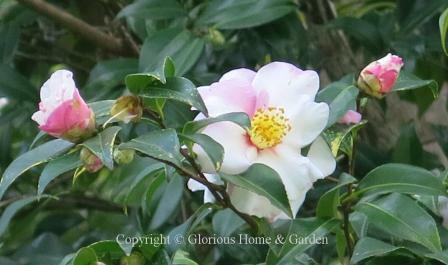 A medium grower at 6-10', it is a hybrid cross probably between C. sasanqua and C. japonica. 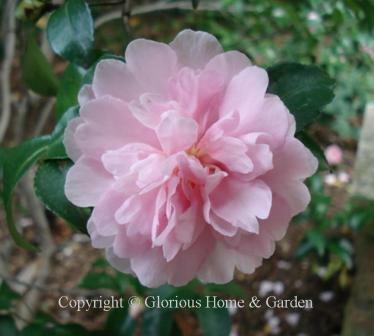 'Shishi Gashira' has rose pink flowers often paler pink in the middle of each petal. 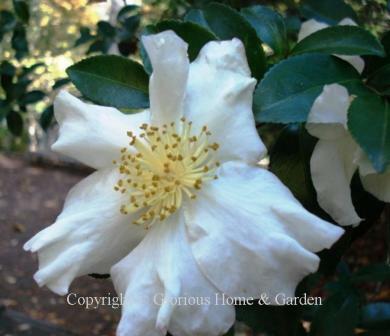 It is a smaller cultivar growing to a manageable 4' x 6' size. 'Sparkling Burgundy' is a C. sasanqua x C. hiemalis hybrid with deep rose peony form flowers with a hint of lavender. 8-15 w. x 6-10' h.
'Yuletide' has single red flowers with yellow centers. It grows is an upright manner making it ideal for accents or containers. Eventually will reach 8-10' with equal spread.